Oh, I am not afraid of death. I believe beyond a shadow of doubt in the immortality of the soul. I am absolutely certain that death will be a pleasant, if not ecstatic experience. I always believe that the best is yet to come, and I extend that belief to life after death. If life is good, then death will be great. On the other hand, I am conflicted. I know that my consciousness is eternal and that I have probably lived many lifetimes in one body or another. But I really like this body. It looks good enough, is aging better than I expected, and most of all, is very healthy. It has always done what I ask it to do: crawl, walk, run, shoot baskets, dance, contort into weird yogic positions, sprawl on the couch. What more could I ask of a hunk of flesh and corpuscle? I also very much like this mind; the one that is communicating with you right now; the one I educated for years and years; the one that has read thousands of books and written six of them. Do you have any idea how much work that’s entailed? Why would I want to start over with a mushy baby mind that can’t string a proper sentence together when I already have this finely tuned machine that once did calculus and can still turn out five pages of smoking prose even on a down day? Why? So you see, despite my optimism about the glory of the death experience, in the end, this birth-age-death-rebirth cycle just does not work for me. I’m sure many of you feel the same way. That is why I decided to look into other options. 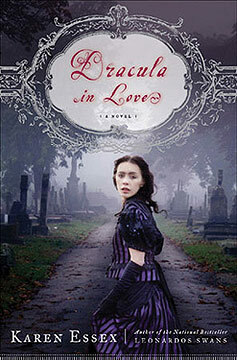 In fact, to write Dracula in Love, I studied every sort of magic and mythology having to do with immortality, and I concluded (along with Dracula) that the best and most attractive option, at least for me, is vampirism. As Dracula himself might have worded it, if life is good and death is great, then how much greater is undeath? Practically speaking, vampirism could facilitate sweeping globally change! We could amortize the enormous investment we’ve made in ourselves over a few centuries at the very least. One of the most depressing things about studying history is that humans do not learn by the mistakes of their ancestors. Every generation has to learn its own lessons in its own time. But imagine a world in which a good segment of the population was immortal. These ancient beings, having been witnesses to so much history, could be our most valuable advisers and our most trusted and wise voices. The accumulated wisdom and knowledge in each undead brain would rival the world’s greatest libraries, and, being immortal, would not be vulnerable to the sorts of things that have destroyed the great libraries of the past such as fire, flood, earthquakes, or marauding hordes of warriors. Thing is, we are very close to being vampires already. Every generation has longed for a fountain of youth but today we actually have youth-extending tools that enable us to reject the very idea of aging. We have stem cell treatments, hormone therapies, miracle herbs and vitamins, cosmetic surgery, and loads of medicines that can keep us alive and looking good past our expiration date. I often run into people who look better than they did twenty years ago! It seems that we are vampirizing ourselves already. The idea is definitely catching on. For centuries, vampires were terrible monsters reflecting cultural fears; now they are more glamorous than rock stars and reflect our deepest fantasies. You can’t throw a stone without running into a woman looking for a Dracula or a Cullen to give her Eternity (and I don’t mean the cologne). Did the vampire community secretly finance a multi-billion dollar image improvement campaign? I think so, and I also think it’s working. I don’t suppose you want to join me for a snack?